My favorite form of historical fiction is by far a retelling of stories from the Bible. Authors Liz Curtis Higgs, Francine Rivers, and Jill Eileen Smith have all made fictionalized retelling of scripture a fine art. The Day I Met Jesus places Frank Viola and Mary Demuth in equal standing with my long time favorites. I knew from the moment I saw the cover that this was a must read for me. Join Frank Viola and Mary Demuth on a fascinating journey back in time as they retell the dramatic accounts of five women who met Jesus. Each narrative is told from each woman’s unique perspective, yet tightly grounded in the Gospel accounts and faithful to first century history. Elegantly written and profoundly stirring, this book blends creative narrative with uncommon insight, spiritual depth, and practical application. I loved so many things about this book. To start, I so enjoyed how each story was told. 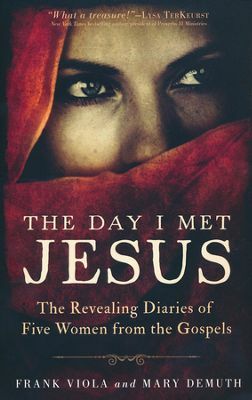 Through the fictionalized retelling, I learned what the life of each woman might have been like prior to meeting Jesus. This made each woman from scripture feel like a person I might know instead of someone from long ago, distant and unrelatable. Further, I appreciated the actual scripture provided at the end of each diary entry. I was able to read for myself in one place the story the Bible tells. The insight into the story following the scripture allowed me to fill in details and reflect in a way I hadn’t before. Lastly, I was thrilled to find a study guide of sorts in the last pages. I am excited to use this book as a study with Bible Study group. In case you are curious, the five women included are the woman caught in adultery, a prostitute, the Samaritan woman Jesus meets at the well, the woman with the issue of blood, and Mary, the woman whom Jesus loved. Each diary entry was fascinating, but I must say, I was most moved by the woman caught in adultery. It was my favorite of the five. To learn more about the authors, check out their websites, frankviola.org, and marydemuth.com.